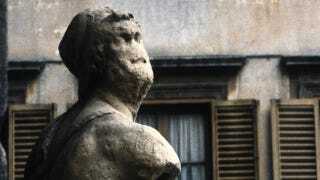 This is Pasquino, a statue near the famous Piazza Navona in Rome. For the past 500 years, it’s where you go when you want to read something mean, snarky, or scandalous about someone, and you didn’t have the internet to help you. The statue Pasquino was created well before the 1500s. Historians think it was probably sculpted in the third century BC. At some point, it became part of layers of wreckage that lie under Rome. In 1501, when appreciation for classical culture revived, the statue was unearthed and displayed in the public square. There, it became part of a saracastic gesture. Cardinal Oliviero Carafa, an enemy of Pope Alexander VI (better known to us as Rodrigo Borgia), decided to dress the statue up and cover it with witty little sayings in Latin. Other people followed his lead. If you had something mean to say about anyone, especially the pope, you put your message on Pasquino. And if you wanted to read something mean and funny, you headed over to the Piazza Pasquino to check out who people were snarking about. The tradition continues. Even today, the base of the statue is covered with flyers saying rude things about people.